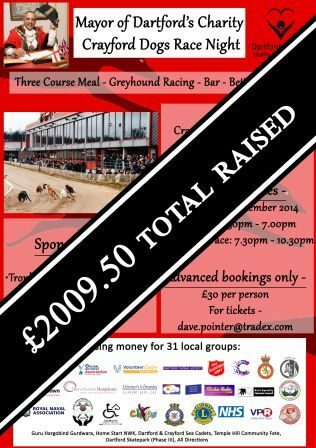 The Mayor of Dartford Avtar Sandhu MBE is hosting a charity fundraising night on the 26th September Charity Crayford Dogs Night 2014 at Crayford Greyhound Stadium to support his 31 groups. After hosting several successful events, Councillor Sandhu is hoping for another sell out at what in previous years has been a very popular event. The Charity Crayford Dogs night for the Mayor of Dartford will consist of a sit down three-course meal, greyhound racing with betting services available, a bar onsite and a chance to have a chat with the Mayor of Dartford himself. The event begins with arrival between 6.30pm and 7.00pm with serving and races beginning approx. 7.30pm. The Charity Crayford Dogs Night is a great time for those who enjoy the thrill of the races and those who just want to come along and socialise. A full raffle will also be available on the night. (ADVANCE ONLY) - The option to sponsor a race is also available. Your company will have a trophy presented to the winner with your trading name printed on as well as a company photo with the winning dog.